There was serious tension in Baboko and Eruda areas of Ilorin West Local Government Area of Kwara State after a notorious cultist, Kale Bayero reportedly hit a passer-by while driving through the area. Bayero was said to have drove off without attending to the unnamed victim around 11:30 pm on Saturday. Speaking with our reporter last night, an eyewitness who pleaded anonymity said, “Kale Bayero was given a hot chase by commercial motorcyclists around 11:30pm after he drove off instead of attending to the victim he hit with his car. According to the eyewitness, upon hearing about his actions, the vigilantes descended on Bayero and he was said to have sustained some injuries. “Bayero after his release mobilised his ‘boys’ who invaded the area and unleashed terror on the people. The boys fought with the vigilantes while others proceeded to the home of community chairman and beat him up. “During the attack, they destroyed goods, cars and other property. They also inflicted serious injuries on some residents of the area. 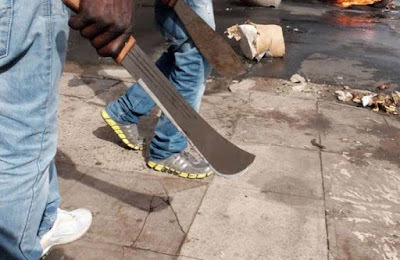 “Yesterday morning, the vigilantes and youths of the community stormed Baboko in an attempt to launch a reprisal attack but they met the absence of Bayero and his ‘boys’, hence they destroyed cars and other valuables,” he disclosed. Meanwhile, the vigilantes have reportedly arrested five suspects and have handed them over to the police while those injured were said to be receiving treatments at the hospital. Efforts to get reaction of the state Police Public Relations Officer, DSP Ajayi Okasanmi on the development proved abortive as calls put through to his mobile phone were unsuccessful while text message sent to his phone was yet to be responded to as at the time of filing this report.